Behaviour of soils in the vadose zone is closely linked to water balance between ground and atmosphere. 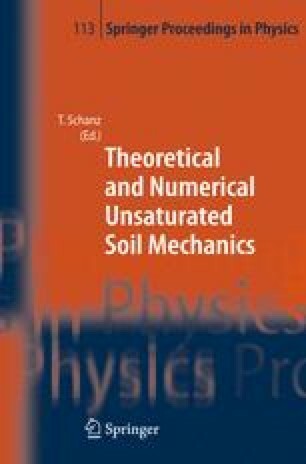 It seems that transpiration is the most uncertain and difficult to evaluate of all the terms in the soil water balance. The key variable to estimate the transpiration rate is the rate of root water uptake, which depends on the hydrological, geological and meteorological conditions. A mathematical model for the rate of root water uptake incorporating the root growth rate, ground conditions, type of vegetation and climatic parameters, has been developed. A conical shape is considered to represent the geometry of the tree root zone. Using this proposed model, the distribution of moisture and the matric suction profile adjacent to the tree are numerically analysed. Field measurements taken from literature published previously are compared with the authors’ numerical model. The predicted results obtained from the numerical analysis, compared favourably with the field measurements, justifying the assumptions upon which the model was developed. The analysis also indicates that soil suction and settlement increase over the time, with the effect being more significant in the first stages of transpiration.